William J. Lipkin, DPM (Millburn) - Book Appointment Online! Our goal is to provide you with the best medical and/or surgical care in order to get you back on your feet as quickly as possible. We make it our business to stay on the cutting edge of technology, medicine and surgery. 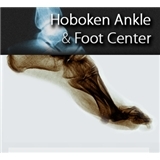 At Hoboken Ankle and Foot Center, we use state of the art equipment and pride ourselves on employing the latest in advanced medical techniques. We have been in the Hoboken area for 19 years and are a favorite referral from many well respected primary care physicians. Why should you go to a Podiatrist for your feet? Podiatric physicians are specially trained doctors. Our education is based solely on treating disorders of lower extremity, which includes the foot and the ankle. This also means that we have to know about the rest of the body as well as other diseases that affect feet, such as diabetes, arthritis and neuromuscular disease. Visit was really smooth. Had no troubles, except my insurance coverage. In the end everything was resolved correctly.